ALCOR laboratory’s BlueBotics Absolem in the field. ALCOR Lab members describe their experience. 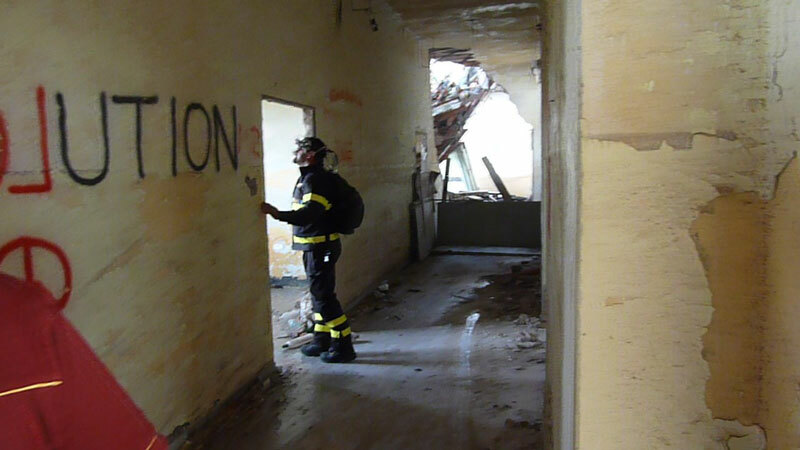 From September 23rd to October 2nd the first TRADR Joint Exercise (TJEx) took place at the Tremora hospital (ex American hospital of Calambrone) near Pisa, Italy, in cooperation with the TRADR partners and the firefighters from the Firebrigade of Pisa. 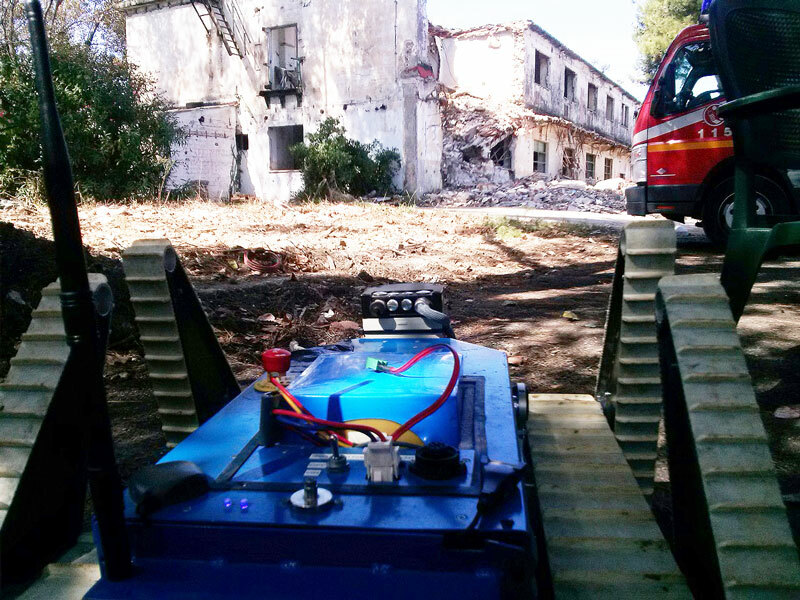 Using a proven-in-practice user-centric design methodology, TRADR develops novel science and technology for human-robot teams to assist in disaster response efforts over multiple missions.Various kinds of robots collaborate with human team members to explore the environment, and gather physical samples. As part of the user-centric development process adopted by the TRADR project, the Joint Exercise plays an important role in establishing and maintaining close contact with the end-users. TRADR is an integrated research project funded by the EU FP7 Programme, ICT: Cognitive systems, interaction, robotics. A firefighter wearing the Gaze Machine. ALCOR Lab is one of the project partners and participated at the exercise with its own UGV and the Gaze Machine, which is a head mounted device that allows estimation at each instant as the wearer looks around the 3D environment. One of the main goals was to test the system components, and to run the system at the hospital site with the participation of end-users. We also collected various useful data and ran component-level experiments. The first week was dedicated to the appropriate set-up and test of the integrated system. At the same time, various discussion groups examined specific issues such as planning, reasoning and robot behavior, user interfaces, database technology and architecture. During the first two days, we tested the functionality of the UAVs and the UGVs in terms of autonomous navigation, mapping in 3D and high-level planning. 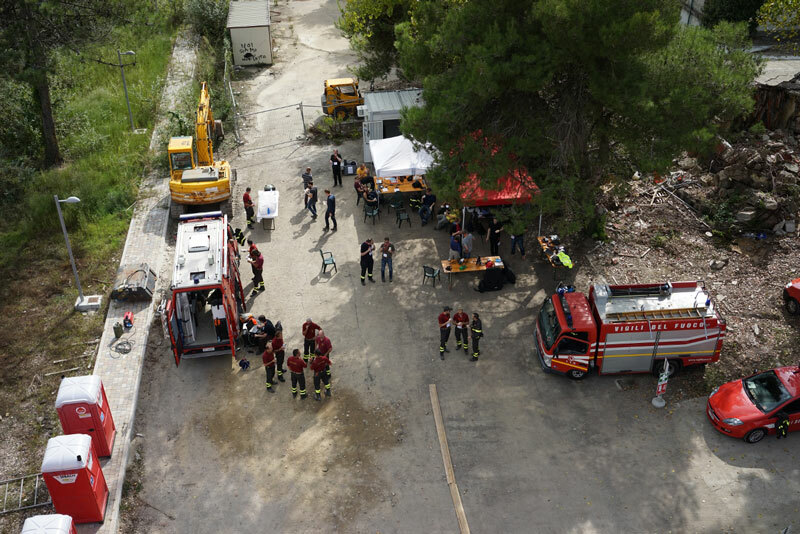 The third day, the firefighters from the Firebrigade of Pisa offered a demonstration of the canine search team. By the end of the first week, everything was perfectly planned and ready for the second phase, when the integrated system was run in the Tremora hospital together with the end-users. 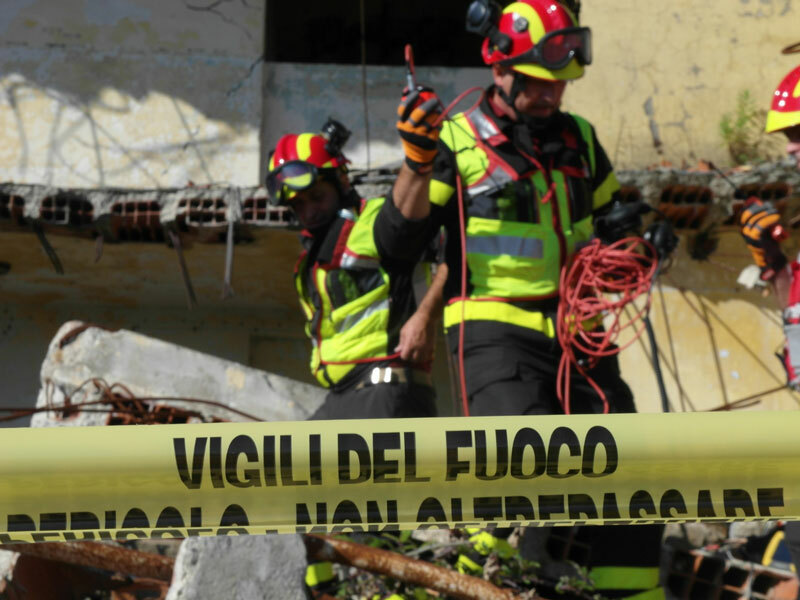 Exercise of the Pisa USAR team. 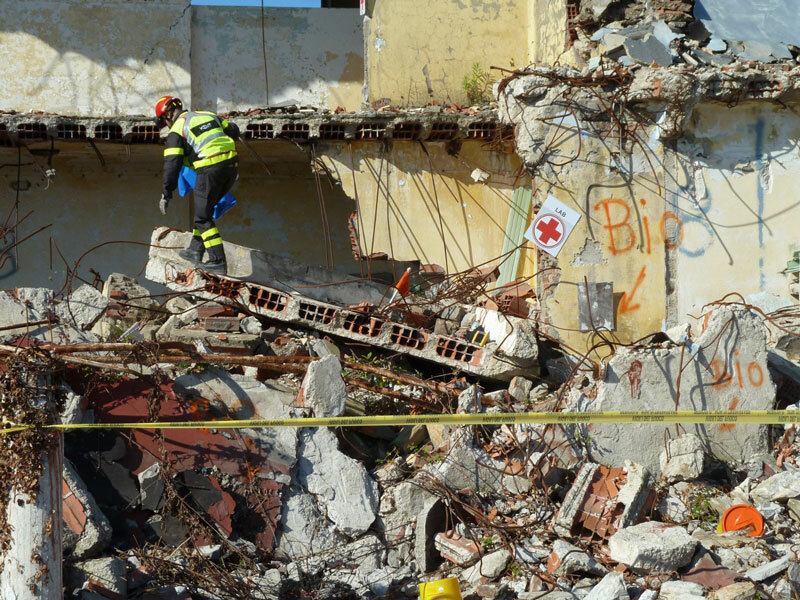 The following days, we successfully performed missions with the complete system in simulated disaster scenario. In parallel, we worked with the firefighters to do a series of experiments using the Gaze Machine. 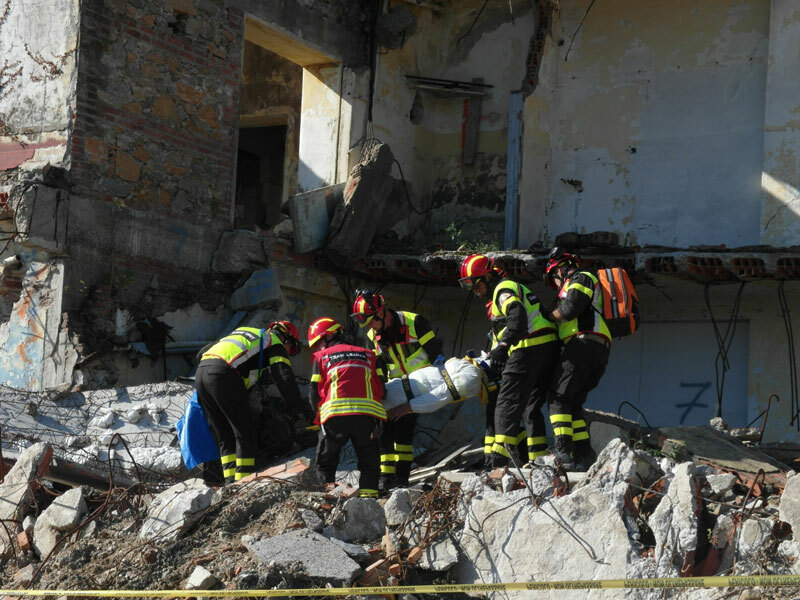 Each firefighter wore the Gaze Machine and entered a partially collapsed building, examining the environment and communicating useful information to their colleagues outside the site. During the experiments we collected data about the areas that they visually inspected, together with the information they communicated to their colleagues. Responsible for the multi-robot planning and of course the Gaze Machine, we are pleased that our lab has contributed to the successful outcome of the first TRADR Joint Exercise. 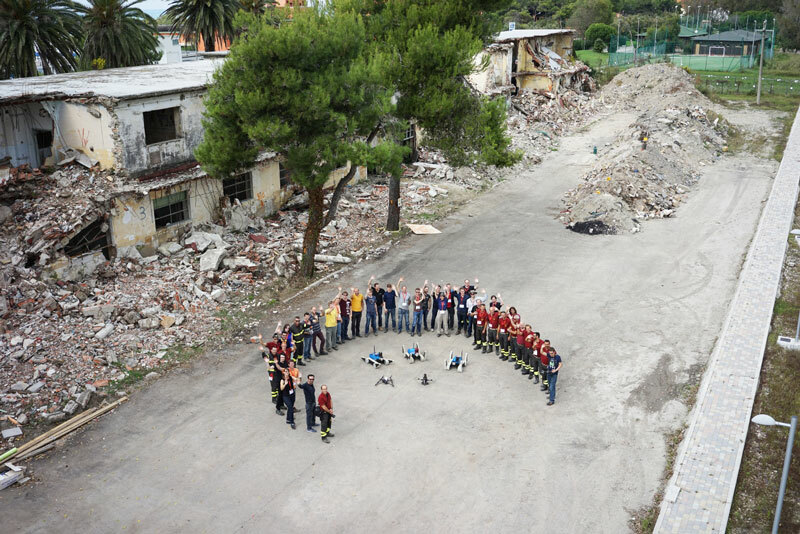 The TRADR team captured by the UAV. The working environment outside the hospital.